I did it! 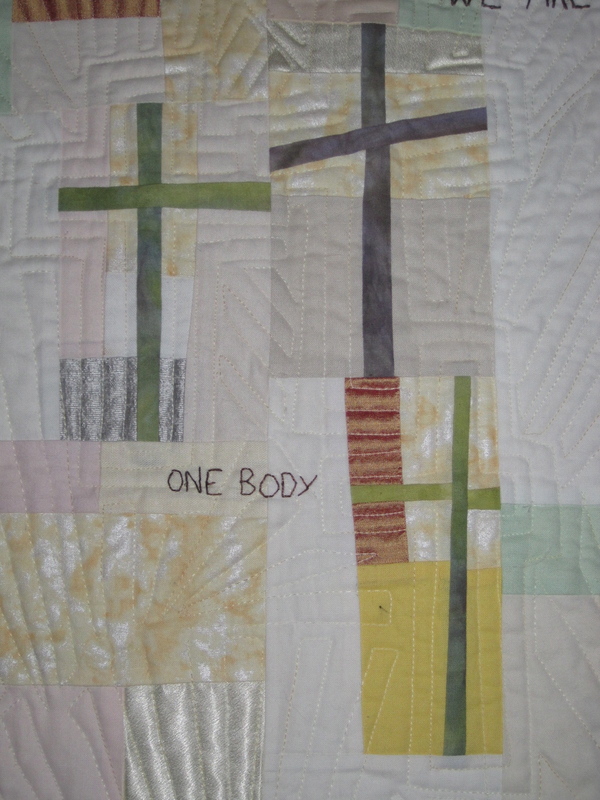 I made it a goal to add my two new quilts to Etsy. The first one took forever, and was rather painful. The second one was a snap. 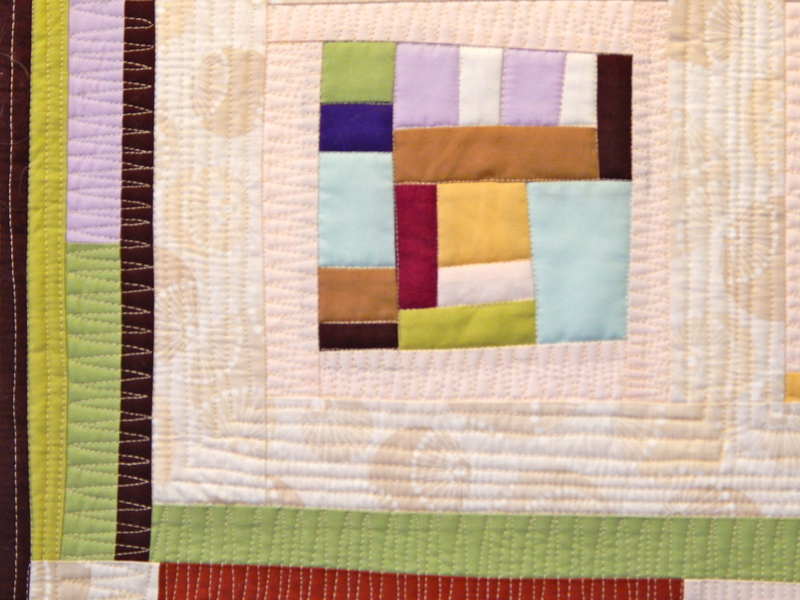 These two quilts were so fun to do, and really got me back on track, working consistently in the studio. 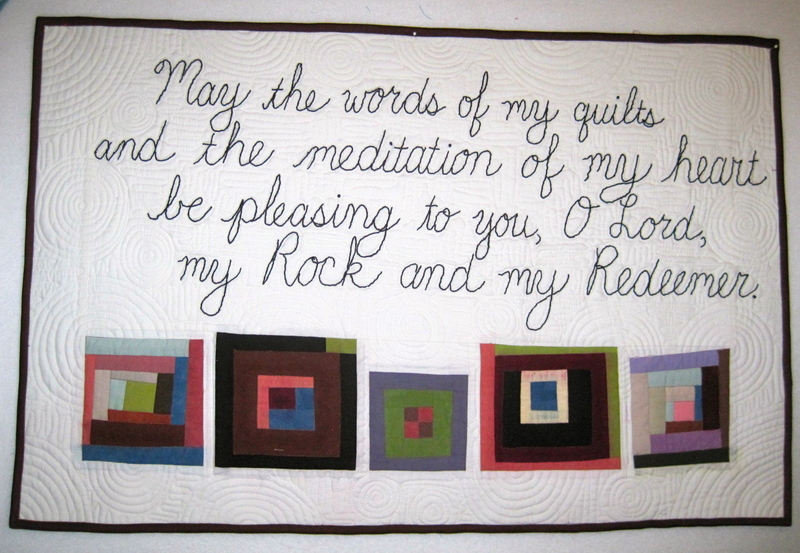 Unlike what I do many times (finish a top and then put it away to “think” about it) I decided I needed to quilt these, finish the edges, AND put the words on them. In other words, COMPLETE them! What a blast. And then as I was completing them, I thought, why not challenge myself to list them on Etsy, as this seems to have been built up into a near paranoia in my mind. Done, and done! Wow, that feels good. You can see them in my Etsy shop by clicking here. Saturday I felt good enough (caught a cold at the end of my trip) to try to get back in the swing of spending a day in the studio. 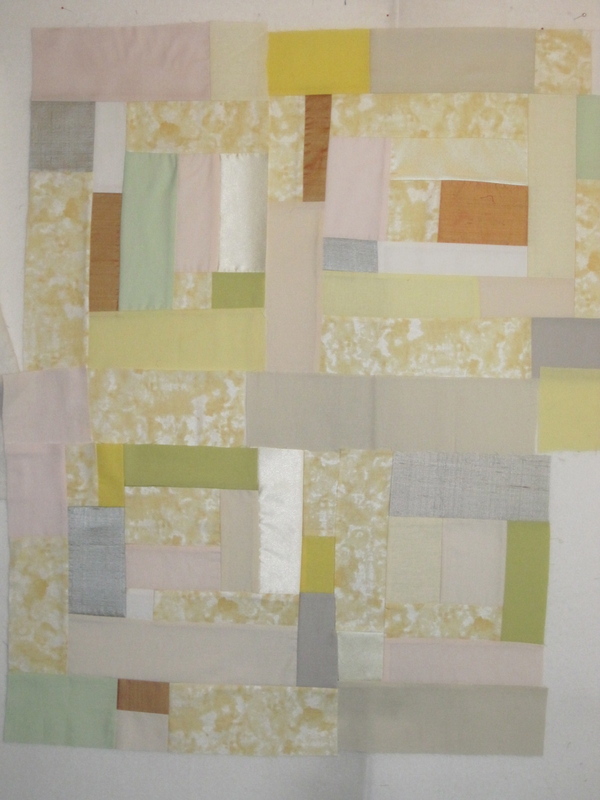 I was having trouble starting work again in my brand new space–you know, the inevitable messiness of a new project. 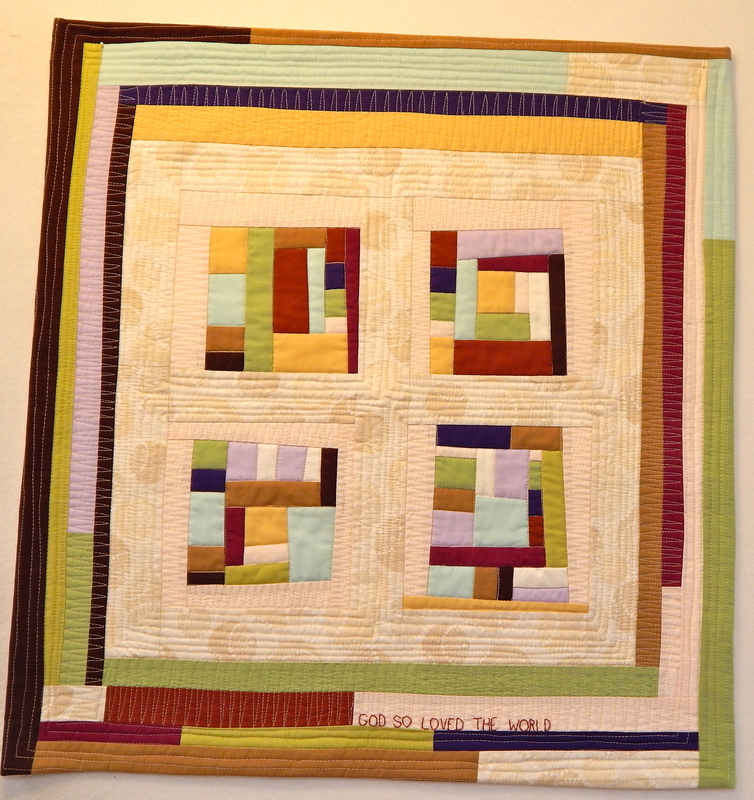 So I started out small, with an orphan block and a few solids I had left on the table before I left on my trip (remember, I made a little travel quilt to take with me.) And pretty soon I came up with this little composition that I really liked. There were still some bright solid scraps left on the table, and I was feeling pretty good about my accomplishment, so I thought I’d go ahead and make one more little quilt top. I went into my bin of solids to add a few colors, and pretty soon I noticed that I was choosing much quieter, more subdued colors. So I decided to just go with that. I wanted to make some smaller pieces. I made four, and then found a bit of a pale print to frame them, and I thought I was done. But the longer I looked at it, I realized it needed a little something more. 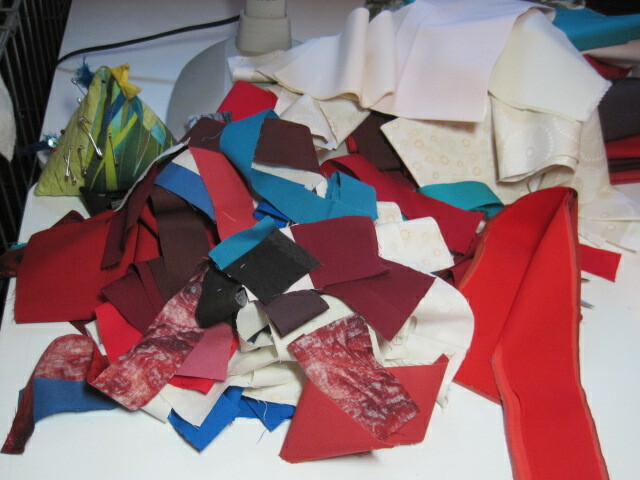 So the next day I just took the scraps of the same colors and started adding them onto the sides. I really liked this composition too! 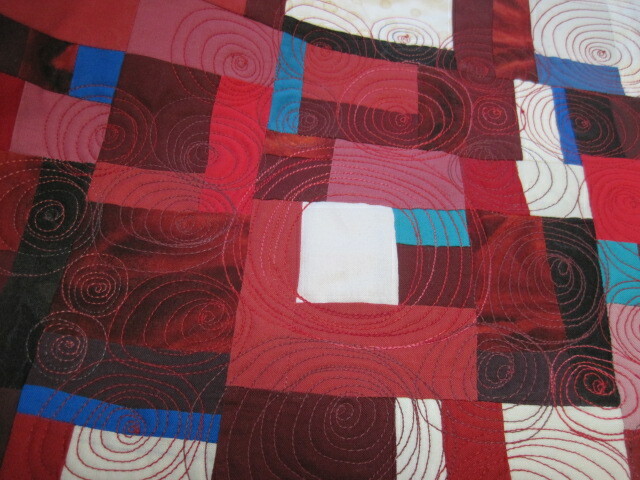 So much so that I decided I needed to go ahead and quilt it today. And best of all? 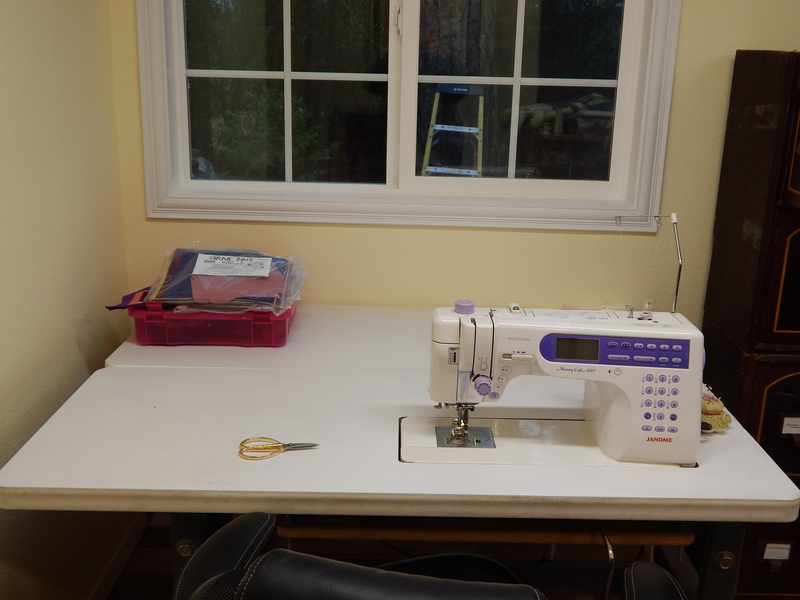 Look–my sewing table is still clear, waiting for the next project! Maybe with the additional space I’ll actually be able to start a new habit of putting things away when I’m done with them. Well, I can dream, can’t I? P.S. Here is a shot of the design wall in place. 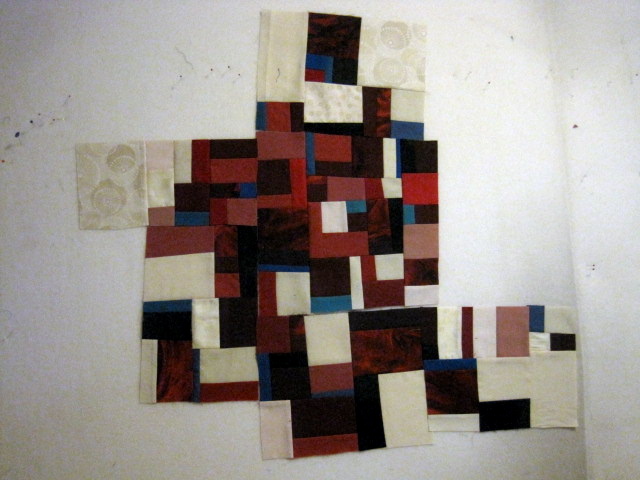 That dark piece is one of Ricky Tims’ hand-dyes. I have it up there auditioning for a big project I have in mind. 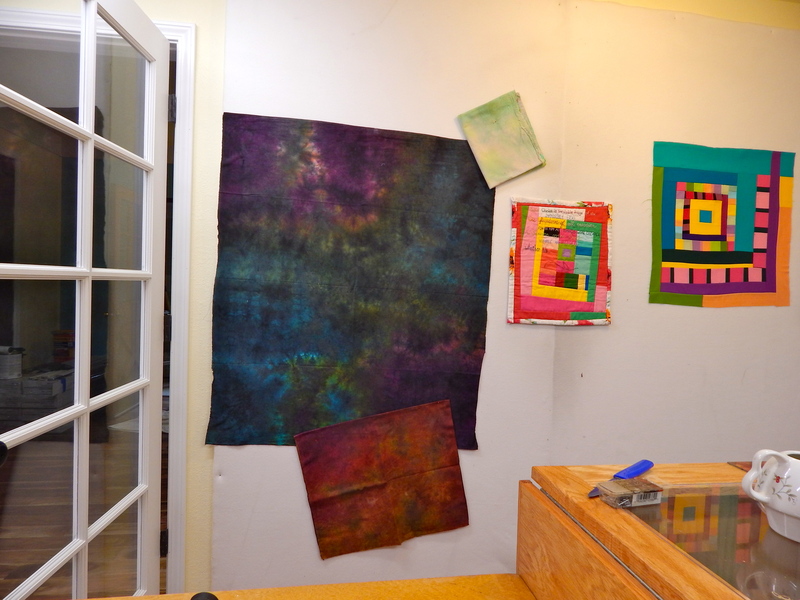 Posted in Creative process, housetop quilts, The new studio! 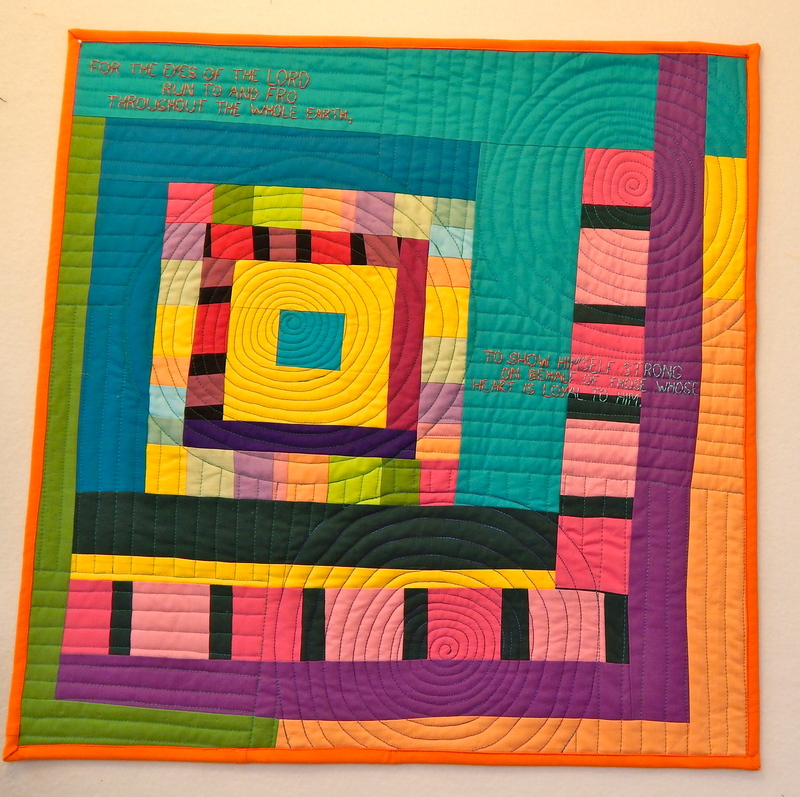 Tomorrow I go to Folsom to hang my quilt show! I can’t believe the day is finally here. 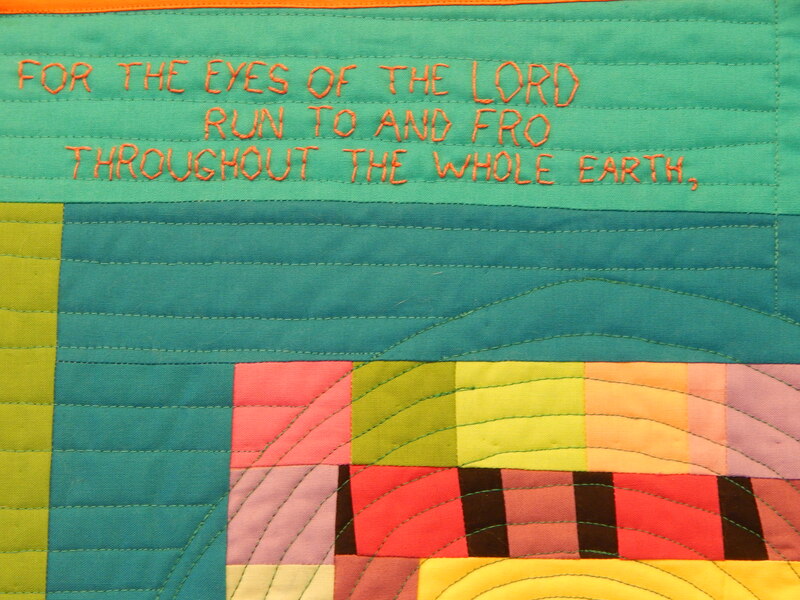 This has been a wonderful almost-year-long challenge to make 20 quilts for this exhibition. I loved almost every minute of it. From the ideas that came flowing freely–many times during church my eyes would light upon a verse that it seemed I had never seen before and had fresh and new meaning for me. 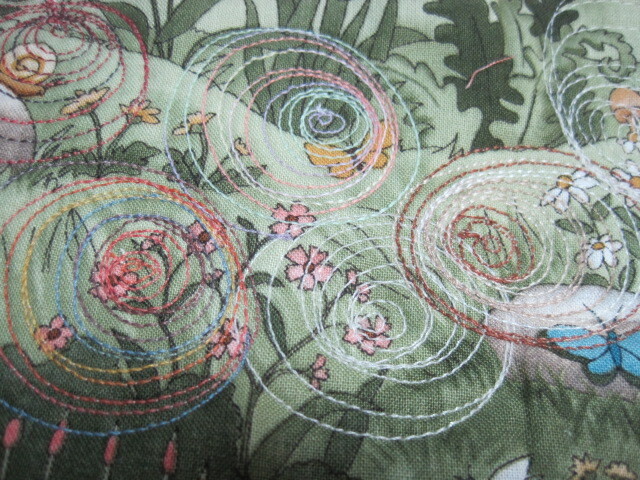 Or sometimes the fabric or the thread would start the idea, and I would find just the right phrase (or chapter!) 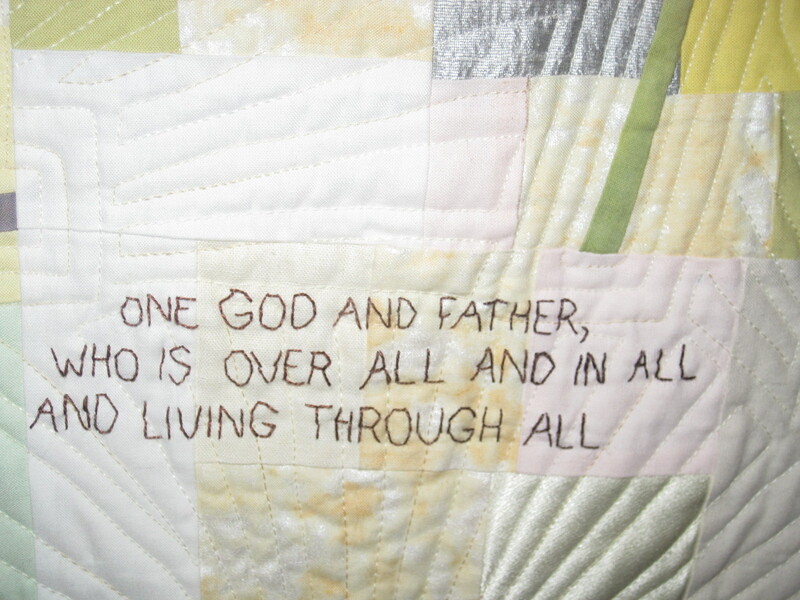 to embroider on that quilt. 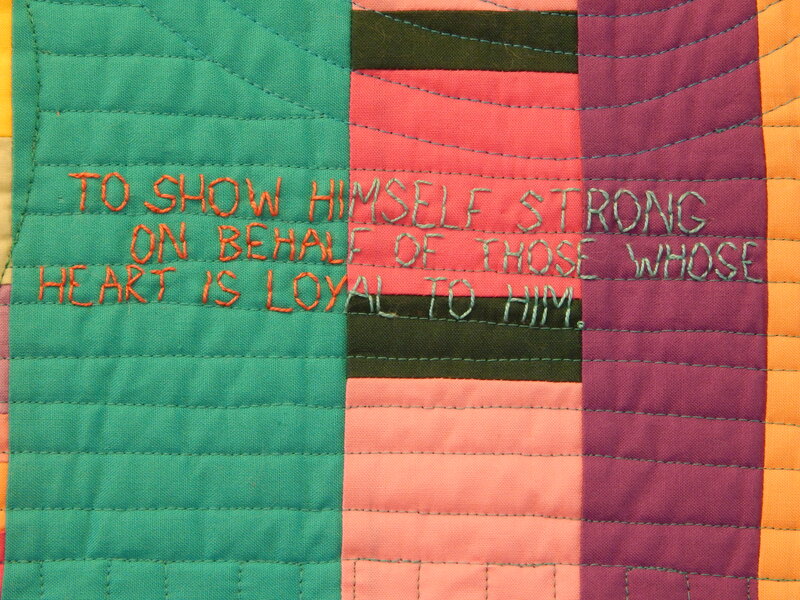 My BF encouraged me to quilt around the lettering to give it some definition. I had never done this before, and I really like the way it looks. 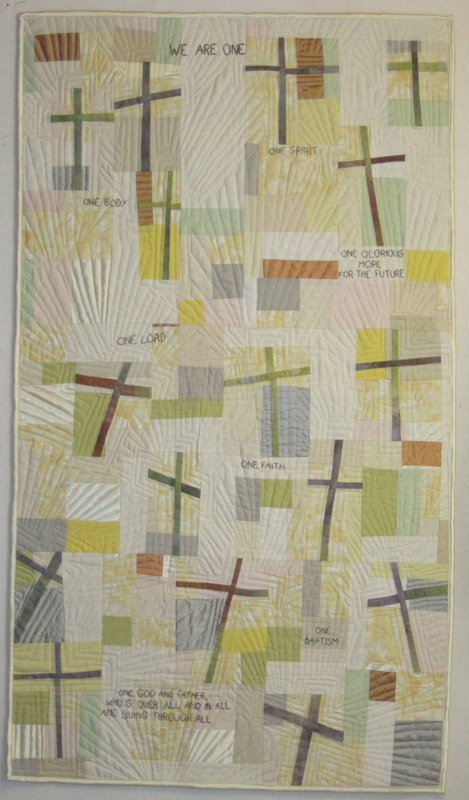 If you are in the area, the quilts will be on exhibit at Oak Hills Church in Folsom, CA, from January 6 until February 10. I will be at Oak Hills on January 27 from 1-3pm for a small reception. I’d love to see you there! 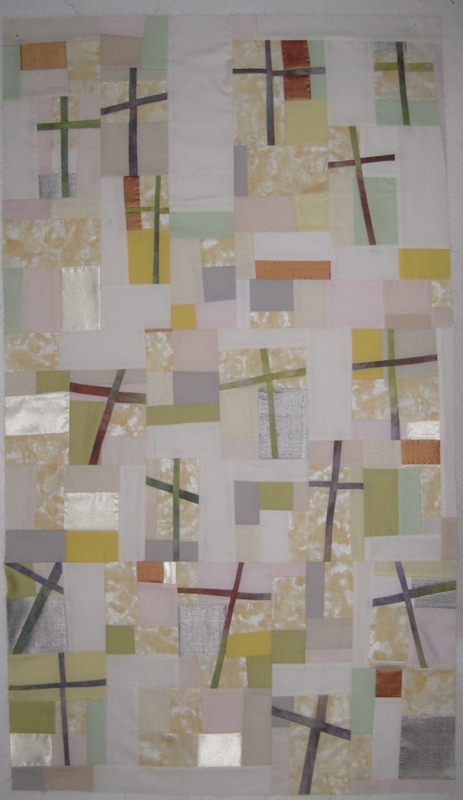 So I actually had an idea about how I wanted to quilt this before I even started piecing it. Ooh. That was fun. I like doing spirals. So I did some more. I definitely like doing spirals. Has anybody noticed how the spiral is a repetitive pattern that God uses in his creation? I have. 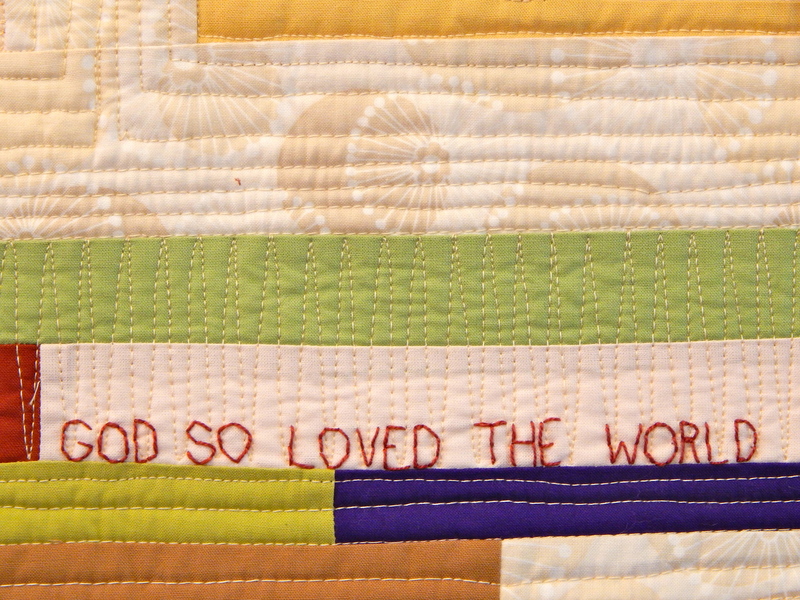 So using these spirals on the quilt with the theme “God Speaks” seems like a natural choice. (the blue line is just a mark for where I want to stop doing the small spirals.) I love those blue disappearing pens. So far I haven’t had any trouble with them disappearing completely. 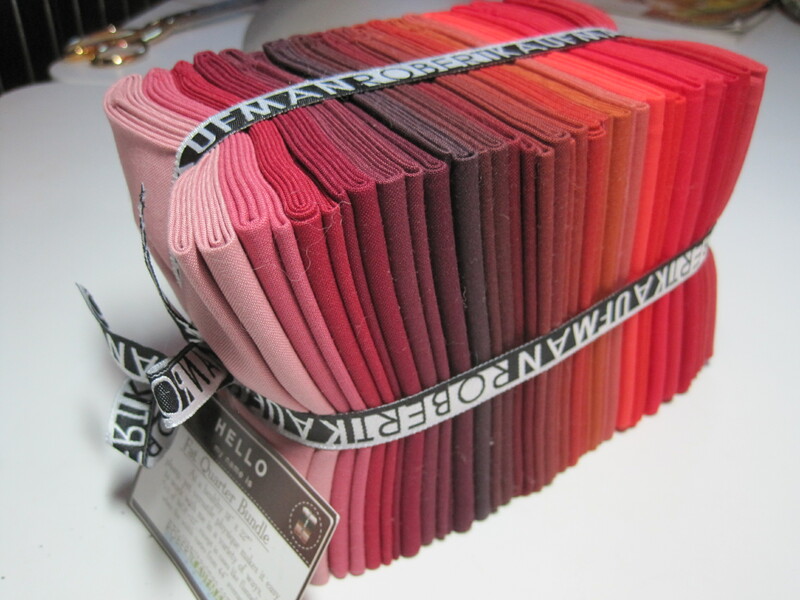 So I started with a wonderful bundle of Robert Kaufman Kona Cottons in all shades of red. I got this at Hancock’s during my trip to Paducah. It looked so pretty like that, it was kind of hard to take it apart. This is where I left off last week. And this is the organized pile of strips and squares that was waiting for me. I worked pretty steadily all day, and finished up by 4pm. Just in time for my afternoon coffee and snack! 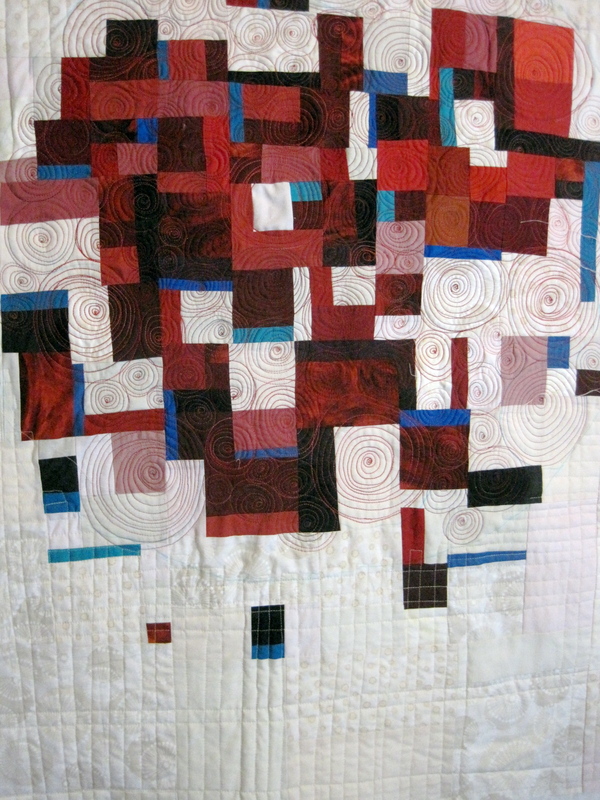 I am not 100% sure I like this quilt. 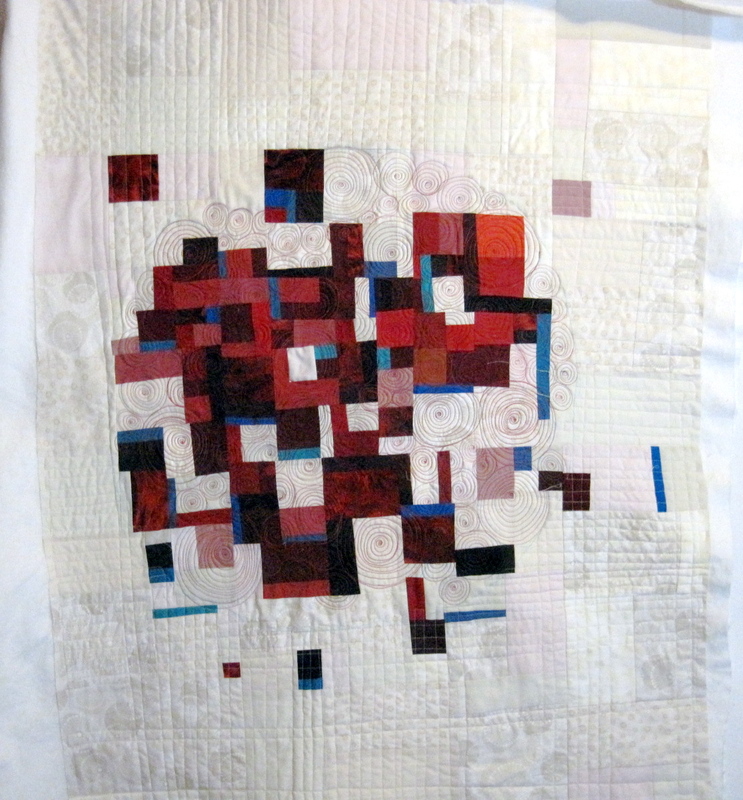 There is a lot of blank space for quilting, and I do have a lot of ideas about what I want to include on it, so we will see. 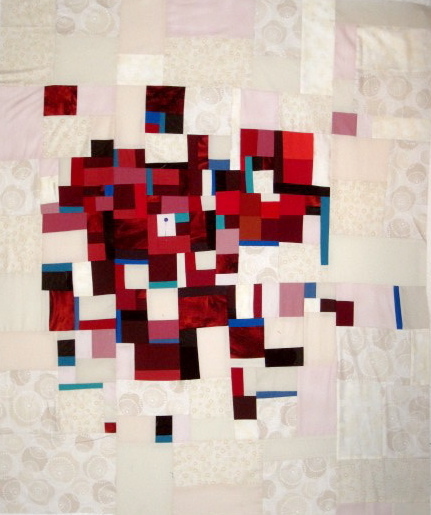 When I work on these quilts, I do no measuring, and I just cut the strips with scissors. This makes for some interesting joins, but it is a very fun and freeing way to work. 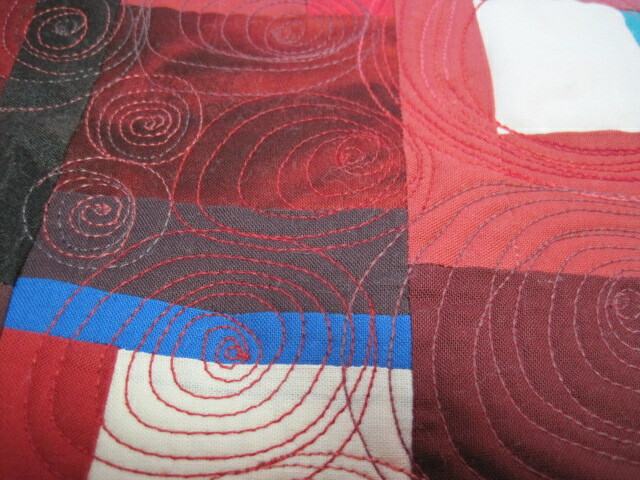 You might notice that I used some prints in this quilt. 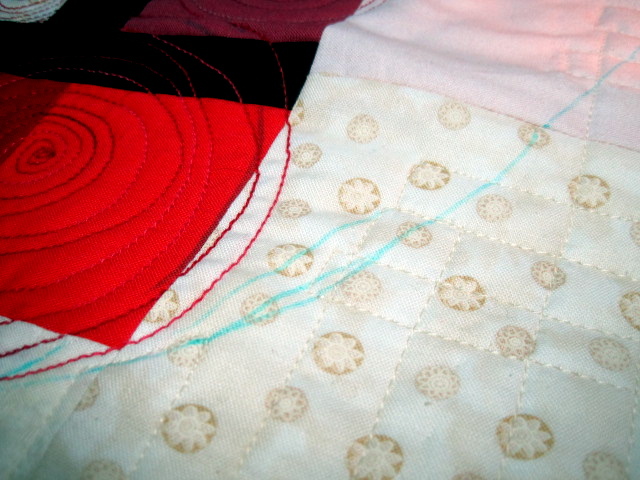 I have only been using solids in the housetop quilts. I think I like the solids better. 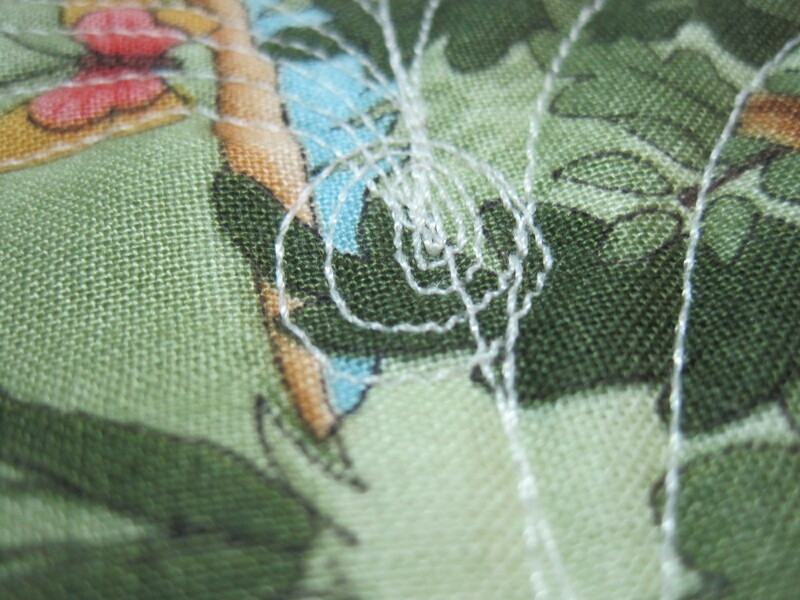 And now, lap time with the doggies, and a little more stitching with the perle cotton! !